Last night as the snow was falling and turning the autumnal landscape into a sheet of white, I thought to myself, it is time to write another blog post. I think it is safe to say summer is now officially over, even if yesterday’s snowfall will be gone by this evening. It is amazing how quickly September flew by, it seems like I was just filling you all in on the adventures of our Whitefish camp and that is already a month ago now. September was not completely smooth sailing for me. I caught a cold at the start of the month, which is always inconvenient but better now than during race season. It’s always the best feeling when you are feeling better and can get back into training! At the top of Mt. Allen, Centennial Ridge run! Mid month Chris decided to switch up training a little and take us on the ridge run he had been talking about all summer. 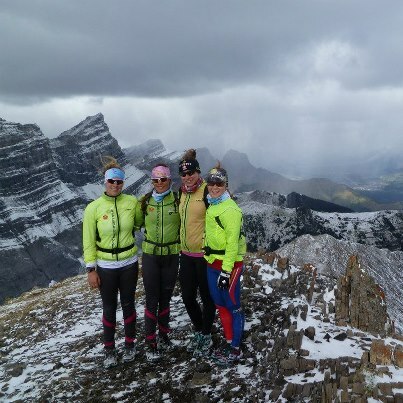 The entire girls team ran Centennial Ridge, up from Ribbon Creek to the top of Mt. Allen and then down the other side finishing at Dead Man’s Flats. It had snowed in the alpine the day before so we were running through a layer of white. The views from the top were breathtaking but we only took them in briefly, the wind gusts at the top were cold and strong. Unfortunately on the way down, on the logging road not even the difficult rocky sections, I sprained my right ankle. The physio told me the next day I had a second degree sprain on all 3 of the ligaments on the outside of my ankle. So that was it, no more running for me. Instead I took to the bike for the first time since June, for the next week all I did was ride and go to the gym. After a week I eased slowly back into roller skiing, this coming week I am going to start running again. Even though my training had to be altered to consist of mainly biking for a while, I am looking at it as a head start for my triathlon training. 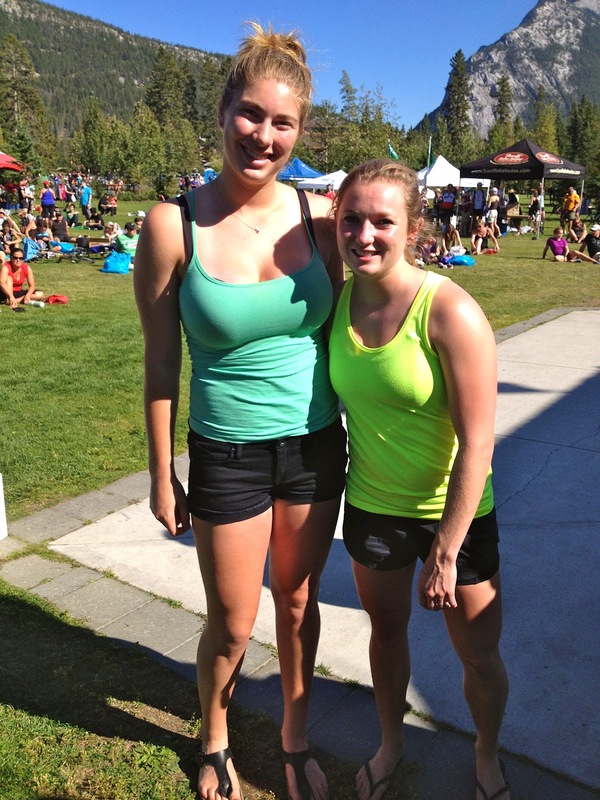 That’s right, after meeting Rosie McLennan (Olympic Gold Medalist in Trampoline) at the Banff Triathlon last month, I have decided that next spring I am going to partake in my first triathlon ever. Watching all the finishers I have decided that the purchase of a visor will be necessary so that even if the race doesn’t go well I will look legitimate no matter what. Another highlight from this month is that I did my first pull up in two years! I know this might not seem very impressive to many of you but for me it has been a goal that I have been working on since last summer. I am proud to say that I have been successfully doing more and more pull ups each gym workout for the past two weeks now! I also want to congratulate my teammate Suzanne who did her first pull up ever this past week; something in our gym plan must be working! Now to wrap up my post with how we wrapped up our month, New Denver camp. 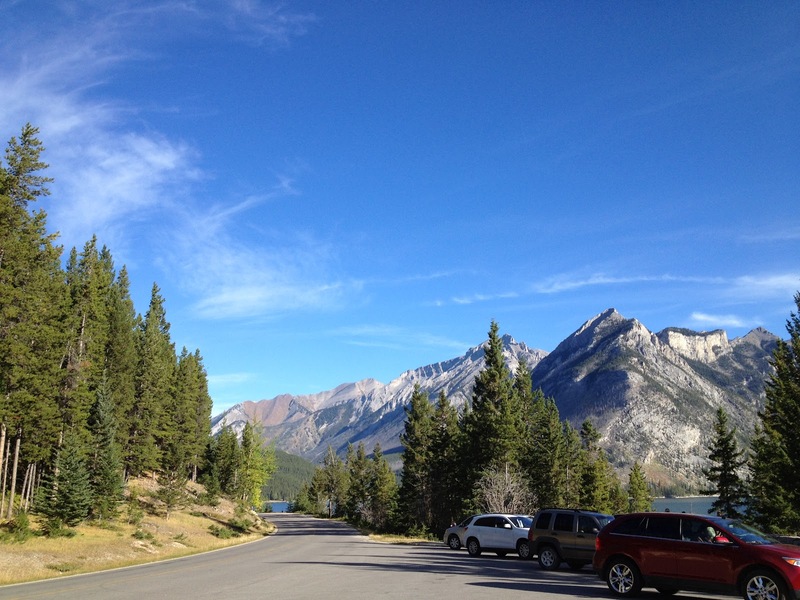 On the 25th we travelled to New Denver, BC, which is on Slocan Lake a few hours south of Revelstoke. We couldn’t have been luckier with the weather, sunny everyday. The training was great we did lots of roller skiing up the pass in between New Denver and Kaslo, including a tough but awesome classic double pole intensity session up from Kaslo on the Friday. 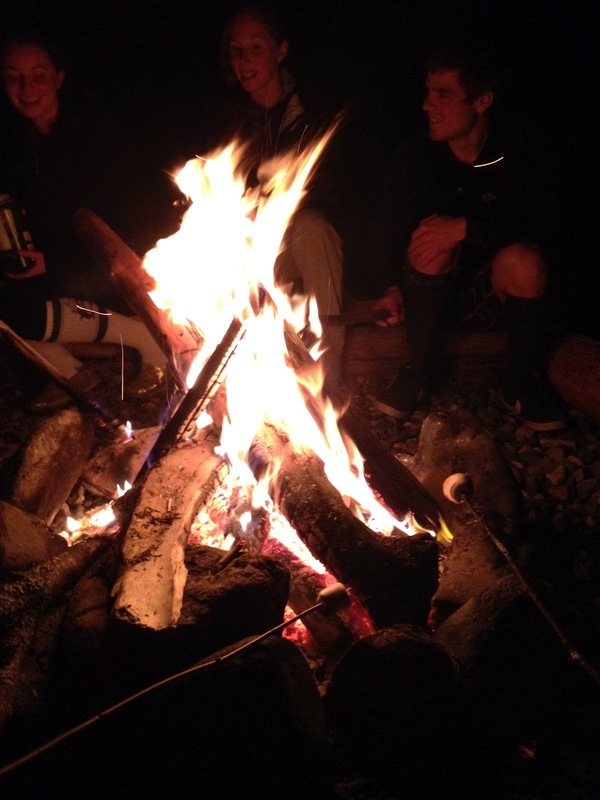 In the evenings we had team campfires down by the lake and made s’mores and orange cakes. For those who don’t know orange cakes are an amazing camping invention where you hollow out oranges and fill them with cake batter and bake them on the coals of the fire. They turned out perfectly, another successful Academy girls baking event! Saturday’s bike ride also brought excitement, with my extreme talent I managed to hit a rock with not just one but with both of my tires, resulting in two flat tires. 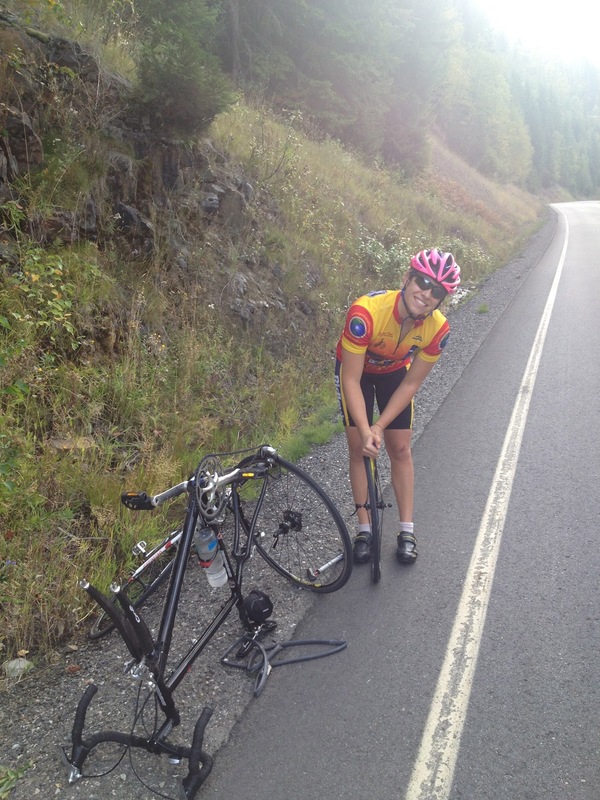 Neither Janelle nor I had ever changed a bike tire by ourselves before, so this was a process but we succeeded. We (more so Janelle than I) managed to change both tires on the side of the road and continue on for the last hour and a half of our bike ride. On the last day of the camp and the last day of the month, the team participated in the Kaslo Sufferfest running race. 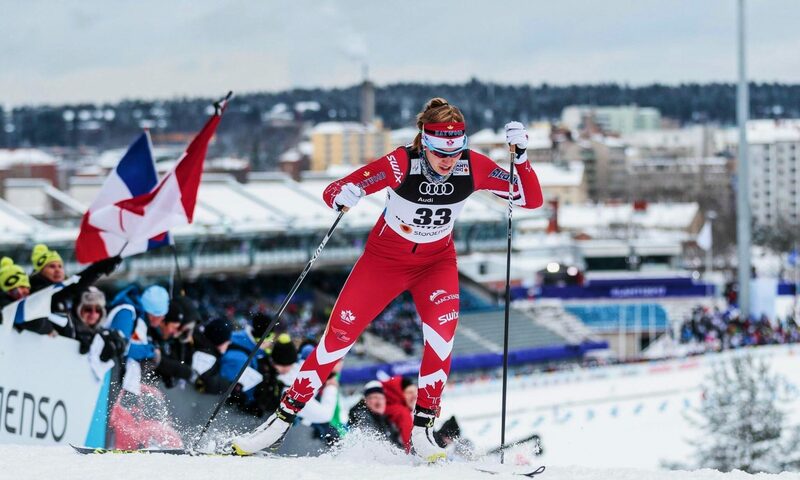 Congrats to Heidi and Patrick for winning the 10k women’s and men’s fields respectively, also to Hamilton who bravely took on the 25k and won that race. Janelle and I since we both still couldn’t run did a hard 10k skate TT. With 3 intensity sessions and 18 hours, the last week of the month was a hard one but also one of the best. There is just something so rewarding about that tired feeling after a great week of training. 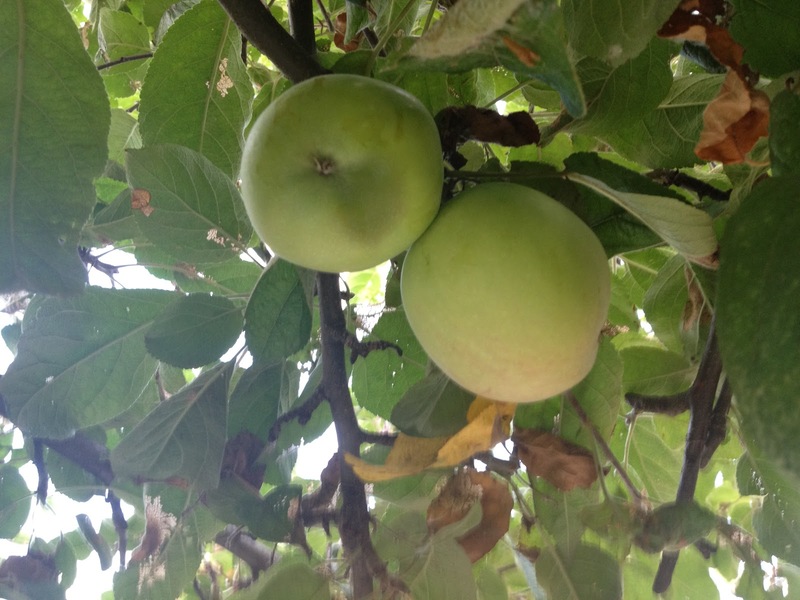 Fresh apples everyday off the trees outside our cottage in New Denver! It’s crazy to think that in just two weeks we will be back on snow for the opening of Frozen Thunder! I can’t wait to ski. Until then Happy Thanksgiving to everyone and stay tuned for an update on Frozen Thunder!